Mohamed El-Shahed/AFP/Getty Images. All rights reserved.In 2011, Egyptians took to the streets, revolting against 30 years of corrupt, oppressive, and regressive military rule. 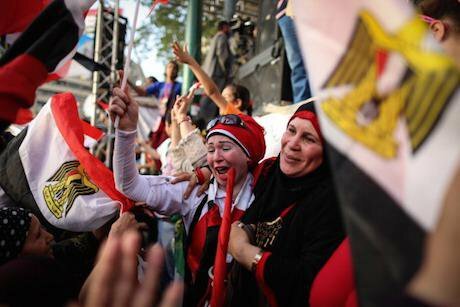 Eighteen days later, Mubarak stepped down. They did it! In 2013, Egyptians took to the streets again calling upon the military to take over from their one-year-old democratically elected regime. Again, they did it! In light of what seems to be a puzzling U-turn after the people's first democratic experience, a few questions ought to be asked: why did the people demand one thing but very shortly after demand the extreme opposite? Who are these people? Are they the same masses revolting against their own demands? Or are they different groups with clashing demands? Amidst all the irony and contradictions, there was one common defining factor for these two events: the very acts of mobilising, mass-gathering, and one-voice-chanting. It was 'collective' action at its very primitive essence. Collective in all terms: physical participation, verbal presence and emotional expression; and free of the political sophistication of whether one agrees or not with the event's particular demands. Disregarding the ‘political’ element of both the 25 January and 30 June events, and other less major mobilisations in between and afterwards, the ‘social’ dimension of the situation becomes vividly clear. These were acts of striving for social belonging; of being a member of a mass, ‘one in many’. By theorising the Egyptian political scene using an International Relations (IR) framework or fascist history, attempting to solve the puzzle around the acts of few leaders, we overlook the needs of the mobilised masses. These were acts of striving for social belonging; of being a member of a mass, ‘one in many’...The average citizen has become a stranger in his own land. Over four decades of neo-liberal policies, initiated by Sadat's Infitah economic policy and well maintained during Mubarak's rule, it was not poverty in its materialistic sense which solely bothered the struggling classes. Building on Galal Amin's Whatever happened to the Egyptians, Hesham Shafick demonstrated that ‘social exclusion and anomie’ were the socio-economic repercussions of Egyptian neoliberalism. That is to say, it is not only the need for food, housing, and health services that the average public citizen in Egypt lacks, but also the sense of belonging: to a society and place, where one feels one of many, an accepted existing human being. Over decades of sustained neoliberal policies, which have translated into westernised consumption, gated spaces, growing class divisions, and the demolition of physical and virtual public spaces, social belonging has vanished. The average public citizen has become a stranger in his allegedly own land, not only left out of the political game and its considerations, but also socially deprived from diminishing public life. Regardless of one's consumption capabilities or social classification, no one belongs anywhere. It is this striving for social belonging that brought people of different social classes, educational backgrounds, religious beliefs and (when rarely present) political affiliations together in ceremonial forms of ‘revolutionary’ gatherings. This way of looking at things explains the festival (rather than the predictably furious) aspect of the ‘revolutionary’ events, all commonly characterised by a euphoric spirit that set aside political disputes. Examples of these include the 25 January and 30 June demonstrations, their anniversaries, and Sisi's recent crowd funding campaign to support the Egyptian economy (without even declaring the purpose/project towards which the money is going). Throughout these diverse events, it is the sense of social belonging that motivates the masses to partake in a revolution, coup, celebration, and crowdfunding campaign, basically anything highly ‘social’. Understanding this in light of Maslow's pyramid of hierarchy of needs, it is the third category of needs, namely ‘society’ that mobilised the masses. The first and second levels of needs, namely the 'physiological' level of food, clothing, and housing needs, and the second level of 'safety' for one's self, property and resources, were obviously defunct. However, expressing those needs was also made defunct by the security apparatus and soothing religious discourse. Political affiliation in this case pertains to the need for 'self-realisation,' which comes last in the hierarchy of needs, as a luxury. So the third need, the only one permitted to function, by the very fact that thousands of potential fellows were out there on the streets waiting to welcome your presence, thoughts and interactions, was the third ‘social’ level in Maslow’s pyramid. All that was needed was a spark of any kind, a lasting critical mass, and publicity to communicate the sociability of the event. This missing element, the sense of ‘belonging’, brought the masses together. The same people who chanted against the Mubarak regime later participated in elections, chanted for Sisi, and may one day chant against him or equally 'sell themselves' for his sake. From this perspective, they are not politically to blame. We are deprived our 'human agency' by our pressing existential need for belonging, a historical need shared by all humanity. If we wish to have (political) agency, we shall first strive for the (social) human to actualise.